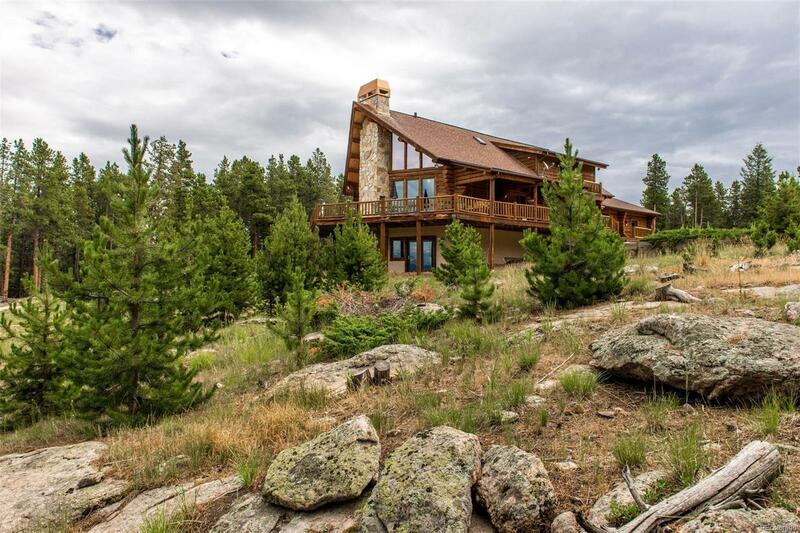 Close-in true log home sits on gentle private 10.35 acres with breath-taking mountain views! Stands of aspen and a variety of mature pine surround the property and frame the views. Log great room has a 2-story wall of glass full of views & hickory flooring that extends into the adjoining dining & kitchen areas. Slab granite kitchen offers center island with bar seating and WP 4-burner gas cooktop, KA convection oven & microwave, GE Profile refrigerator, Maytag dishwasher and "blue" pine cabinetry. 2 bedrooms, full bath + mud room with walk-in pantry & garage access complete the main level. Upstairs is the large sky-lit vaulted master with private deck, big walk-in closet & 5-piece marble bath, jetted tub + roomy shower. Sky-lit loft extends off the master offering views and flex space for an office, meditation area or gym. Walk-out level has big game/media room, 3/4 bath, laundry and excellent storage. Wrap-around deck plus walk-out patio provides lovely outdoor living. Shed.